For me, the red flags went up just a couple of minutes into Justice League, as Batman hunted a goon in an admittedly impressive bout of authentically stealthy intimidation. Ultimately subduing his target, the Bat strings him up and dangles him over the rooftop edge. But this isn’t just torture. It’s torture with a purpose. Batman is using the goon’s fear to draw out one of main villain Steppenwolf’s flying, terror-feeding Parademons, an interloping, extraterrestrial species that Bruce Wayne, in classic detective mode, has been quietly observing and studying for some time. A short battle later, and the beast is vanquished. Following the altercation, a nearby, unnamed observer - could be the goon from before, could be someone else; Justice League pays little attention or clarity to characters who aren’t the Justice League, as will become increasingly evident - asks what the hell he just saw. Batman bluntly states that it was a scout. The non-specific, civilian observer’s response? A torrent of expository detail that he could not possibly have known. Batman seems to ignore the startling, implausible insight of this conveniently clued-in, random passerby, but I cannot. This disturbingly prescient, unnamed nobody somehow knows as much as Batman does, and no-one ever knows as much as Batman does. And he knows all of this for no other reason besides that his doing so makes for a quick and dirty way for Justice League to lazily throw out its backstory setup. The red flags are up. Justice League is not taking its world - or the narrative it builds within that world - seriously. There’s a false wisdom that often comes up in discussions of fantasy and sci-fi fiction, which purports that the integrity of storytelling doesn’t matter if you’re dealing with an unreal situation. In truth, the opposite is the case. Believable humanity, world-building, and relatable internal logic are the fundamental keystones to making any situation plausible and resonant. These things are vital to making a story connect, but when dealing with far-fetched, imaginary subject matter, they’re your secret weapon. You can make any scenario feel real if you first make sure that the people and relationships within that scenario ring true. Justice League is ultimately shattered by the fact that it never takes the time to do any of this. That catastrophic failing shudders through the movie’s every layer like a rattled fault-line, but it’s most apparent in Steppenwolf himself. The relationship between protagonist(s) and antagonist is the drama, in any story. The two opposing forces must test each other. They must push each other to succeed and fail at various times, fueling their respective abilities to learn about both themselves and their opposition in order to prevail. Every story is really about two journeys layered on top of each other. There’s the surface level journey, from starting point to end-goal, but there’s also the internal character journey that each hero (and villain) must navigate in order to attain the means to reach that endpoint. The latter is the one that really matters. It’s the fuel of the narrative. And the engine that heats and delivers it is the relationship. There always has to be a relationship. But Justice League does not give us one, because it does not give us a villain. Steppenwolf exists in physical presence only. He is an empty cipher. A hollow container who only superficially represents threat. He has no personality, no real desires, no ability to connect or drive an interplay with the heroes. He is a concept rather than a character, and one that very much exists intangibly. For all the dramatic effect he has on shaping the story, he might as well be a countdown timer to the final battle. He could be replaced with an alarm clock, and the tale would play out just the same. But while the villain provides no means of paving the heroes’ journey, the heroes themselves are similarly incapable of movement. I’d had mixed feelings when Justice League’s surprisingly short, two-hour running time was announced. I had no desire for a bloated, meandering, Batman v Superman-style, three-hour trudge of attrition, but Justice League always had greater narrative needs than its predecessor. It had to fully establish three thus-far barely glimpsed lead characters who had previously not had a line of dialogue between then. It had to let them evolve along their own separate paths, before finding a plausible way to integrate all five of the (currently living) Justice League into a group, forging a new collective personality, and then sending that on its own journey of discovery and triumph. It had to bring Superman back from the dead, in a way that surprised despite the event’s inevitability, and deal with the emotional aftermath of both Batman v Superman, and Clark’s return into a world still mourning him. I wouldn’t have questioned a longer Justice League. I would have felt more secure about it, in truth. How does Justice League handle the challenge of wrangling all of the above? Simply, it doesn’t even make an attempt. There’s a promising early moment, when a terrified Flash, having only previously used his powers for miscellaneous screwing around, almost breaks down in the face of battle. Batman treats the situation with subtly warm insight, tasking Barry with rescuing just one person, knowing that the rush of newfound heroism will push him to continue. It does, and the nervous newcomer’s world-view changes in an instant. But this is the first and last time Justice League does anything like this. Otherwise, its protagonists remain static. Justice League is incapable of telling a real story. It simply depicts a series of events, empty of meaning. Batman is less pathologically furious here than in his previous outing, but that’s apparently just who he is now. There’s no evolution. He’s simply different. But he remains different in the exact same way for two solid hours. Wonder Woman is stoic, earnest, and capable, but, like the rest of the cast, she never undergoes any trial, physical or emotional, that tests any of these qualities. Aquaman is generically cocky and generically cool, and disinterested in joining the team until suddenly there’s a water-based set-piece, and then he’s on the team. His personality and mindset never seem to change in order to justify this, but once he’s officially a member of the Justice League, the movie deems its job done and moves on. It’s the same with Cyborg. Easily the most broken hero, with the steepest hill to climb, he’s initially distrustful not just of the squad, but of the entire outside world. His path to self-realisation? After two minutes of wracking my brain, I honestly can’t remember, and I only saw the film two days ago. Diana tries - and fails - to talk him round at one point, but then later he’s just in the League. I feel no guilt for not remembering the details, because the movie provides no more nuanced character path than my current void of occasion for any of its other heroes. With neither good guys nor bad on any personal journey, let alone one which lets them have the slightest developmental effect upon each other, Justice League is incapable of telling a real story. It simply depicts a series of events, empty of resonance or meaning. But Justice League has two further, fundamental failures to record, both of which bury any hope the movie has of delivering even accidental moments of drama. One is an issue of tone - or rather, a lack of it. 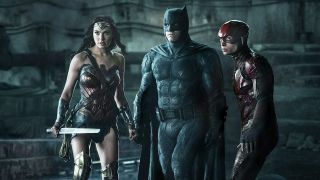 Apparently running hard and fast from Batman v Superman’s (justified) reputation as a haven of vapid misery, Justice League fails to look where it is going, and bails full-tilt into quip canyon. It’s hard to know how much of Justice League’s relentlessly, mindlessly japey script was part of the original plan, and how much was added later during Joss Whedon’s reshoots, but ultimately it doesn’t matter. Ceaseless, needless, weak jokes and one-liners fall upon every scene like rain - rarely called for, rarely justified, and rarely funny, but drowning all intent, mood, or purpose that any individual sequence might have once had. Such wild and frequent tonal U-turns mean that few scenes can effectively communicate anything of meaning. Batman v Superman is an awful film, but it’s at least the product of a distinctive if flawed vision. Justice League dances so hard and so fast, so frantically eager to please all and offend none, that ultimately it has nothing for anyone. It has no vision. It has no voice, and no personality. It is the awkward kid at the party, desperate to be accepted and liked but not sure how, throwing out the crappy gags and funny voices, and ultimately giving no-one anything real to connect to. Like that kid, it seems to not understand how alienating an overbearing, directionless drive to please can be. There are wisecracks, and snappy put-downs aplenty, but not one of them comes from anywhere with a heart or soul. But if all else fails, and Justice League really has no genuine humanity whatsoever to offer from within its main story, then surely the tertiary peril of a world awaiting apocalypse should be able to make us feel something, yes? Well, no. Because Justice League, somehow, is an end-of-the-world movie that forgets to include the world. For all of its status as the DCEU’s biggest, crowning event thus far, for all of its World’s Finest heroes and planet-eating villains, it is the franchise’s smallest and most inconsequential movie yet. Nobody lives in Justice League’s world but the Justice League and the monsters they fight. There is no fear, no fallout, no response or consequence from the world at large that these heroes battle to save, because there is no world beyond these heroes. There are only the rooms that the Justice League stand in, and the conversations that the Justice League have. For all of the sad, CG flags we see mourning Superman’s passing early on in the film, there's no response when he eventually returns, in an empty street, devoid of witnesses, the resurrection of a beloved god apparently impacting the life of no-one. We see no response either, to Steppenwolf destroying and annexing an isolated foreign city. No news reports, no military response, no fear in the streets. Nobody even notices. This is a movie about an alien invasion that somehow passes the world by. An attempted takeover of the planet by a hostile alien force that, for all the planet's reaction to it, might as well be a hallucination on the part of the League themselves. Perhaps the special edition will reveal the influence of the Scarecrow’s psychotropic gas. There is no other explanation for the lack of human reality in this world. Justice League is a $300 million movie with the scale and artificiality of a wooden stage set. And worst of all, the film knows it. Hence its one, hilariously creaky attempt to instill some kind of stakes, somewhere, anywhere, as it repeatedly cuts back to a single, unnamed family whose home remains inexplicably next door to Steppenwolf’s growing alien base. We do not know who they are, we do not care, and we never will. Because they are nobody, and their situation makes no sense. But the movie keeps pushing them into our faces until the end, a last attempt at humanity so contrived that it only makes the whole sorry affair more transparently mechanical. The only empathy and sadness we feel is for the movie’s desperation, and even that is tinged with contempt at the insult. Sadly, all of this failure stems from the same, obvious place. Justice League’s failure to connect, to make its characters human, to drive its story with relationships, within a world that feels real, is the inevitable end-game of DC’s panic to catch up with Marvel’s MCU. In refusing to take the time to establish its characters in their own movies, in its unswervable desire to cut straight to The Big Event Film, the DCEU overlooked what makes an event work in the first place. Spectacle matters, yes. Apocalyptic threats can work too. But ultimately what’s important is that we care about the people involved. In that respect, Justice League is running late the moment it starts and, even with a third hour to play with, would not have had time to do the emotional groundwork required to make any of this land. Always sprinting to catch up with itself, the movie then cuts all of the wrong corners in order to get ahead. What we’re left with is a lifeless automaton, lacking the warmth, depth, and humanity that makes stories believable. A third of a billion dollars spent on clacking action figures soundlessly together, over and over and over again.